For other uses, see Norns (disambiguation). The Norns (Old Norse: norn, plural: nornir) in Norse mythology are female beings who rule the destiny of gods and men. They roughly correspond to other controllers of humans' destiny, such as the Fates, elsewhere in European mythology. 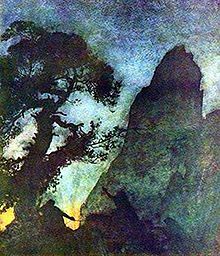 In Snorri Sturluson's interpretation of the Völuspá, Urðr (Wyrd), Verðandi and Skuld, the three most important of the Norns, come out from a hall standing at the Well of Urðr or Well of Fate. They draw water from the well and take sand that lies around it, which they pour over the Yggdrasill tree so that its branches will not rot. These three Norns are described as powerful maiden giantesses (Jotuns) whose arrival from Jötunheimr ended the golden age of the gods. They may be the same as the maidens of Mögþrasir who are described in Vafþrúðnismál (see below). Beside these three famous Norns, there are many others who appear at a person's birth in order to determine his or her future. In the pre-Christian Norse societies, Norns were thought to have visited newborn children. There were both malevolent and benevolent Norns: the former caused all the malevolent and tragic events in the world while the latter were kind and protective goddesses. The origin of the name norn is uncertain, it may derive from a word meaning "to twine" and which would refer to their twining the thread of fate. Bek-Pedersen suggests that the word norn has relation to the Swedish dialect word norna (nyrna), a verb that means "secretly communicate". This relates to the perception of norns as shadowy, background figures who only really ever reveal their fateful secrets to men as their fates come to pass. The name Urðr (Old English Wyrd, Weird) means "fate". Wyrd and urðr are etymological cognates, which does not guarantee that wyrd and urðr share the same semantic quality of "fate" over time. Both Urðr and Verðandi are derived from the Old Norse verb verða, "to be". It is commonly asserted that while Urðr derives from the past tense ("that which became or happened"), Verðandi derives from the present tense of verða ("that which is happening"). Skuld is derived from the Old Norse verb skulu, "need/ought to be/shall be"; its meaning is "that which should become, or that needs to occur". 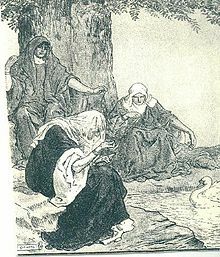 Due to this, it has often been inferred that the three norns are in some way connected with the past, present and future respectively, but it has been disputed that their names really imply a temporal distinction and it has been emphasised that the words do not in themselves denote chronological periods in Old Norse. These unclear distinctions among norns and other Germanic female deities are discussed in Bek-Pedersen's book Norns in Old Norse Mythology. Mímer and Balder Consulting the Norns (1821-1822) by H. E. Freund. There are a number of surviving Old Norse sources that relate to the norns. The most important sources are the Prose Edda and the Poetic Edda. The latter contains pagan poetry where the norns are frequently referred to, while the former contains, in addition to pagan poetry, retellings, descriptions and commentaries by the 12th and 13th century Icelandic chieftain and scholar Snorri Sturluson. A skaldic reference to the norns appears in Hvini's poem in Ynglingatal 24 found in Ynglingasaga 47, where King Halfdan is put to rest by his men at Borró. This reference brings in the phrase "norna dómr" which means "judgment of the nornir". In most cases, when the norns pass judgment, it means death to those who have been judged - in this case, Halfdan. Along with being associated with being bringers of death, Bek-Pedersen suggests that this phrase brings in a quasi-legal aspect to the nature of the norns. This legal association is employed quite frequently within skaldic and eddic sources. This phrase can also be seen as a threat, as death is the final and inevitable decision that the norns can make with regard to human life. The Poetic Edda is valuable in representing older material in poetry from which Snorri tapped information in the Prose Edda. Like Gylfaginning, the Poetic Edda mentions the existence of many lesser norns beside the three main norns. Moreover, it also agrees with Gylfaginning by telling that they were of several races and that the dwarven norns were the daughters of Dvalin. It also suggests that the three main norns were giantesses (female Jotuns). And the babe from the mother bring?" It appears from Völuspá and Vafþrúðnismál that the three main norns were not originally goddesses but giantesses (Jotuns), and that their arrival ended the early days of bliss for the gods, but that they come for the good of mankind. 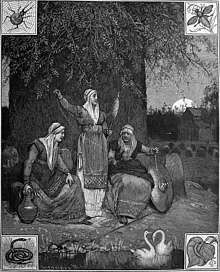 The Norns Urðr, Verðandi, and Skuld under the world oak Yggdrasil (1882) by Ludwig Burger. Doomed me In waters to dwell." so I longer must live. A statue of the Norns at St Stephen's Green, The Tree Faites, donated by the German government in thanks for Operation Shamrock. when the Norris have spoken." Then said Gangleri: "If the Norns determine the weirds of men, then they apportion exceeding unevenly, seeing that some have a pleasant and luxurious life, but others have little worldly goods or fame; some have long life, others short." Hárr said: "Good norns and of honorable race appoint good life; but those men that suffer evil fortunes are governed by evil norns." That dew which falls from it onto the earth is called by men honey-dew, and thereon are bees nourished. Two fowls are fed in Urdr's Well: they are called Swans, and from those fowls has come the race of birds which is so called." 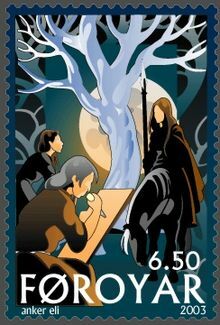 ...and the youngest Norn, she who is called Skuld, ride ever to take the slain and decide fights...Faroese stamp by Anker Eli Petersen depicting the Norns (2003). These are called Valkyrs: them Odin sends to every battle; they determine men's feyness and award victory. Gudr and Róta and the youngest Norn, she who is called Skuld, ride ever to take the slain and decide fights. the Norns' doom is evil." 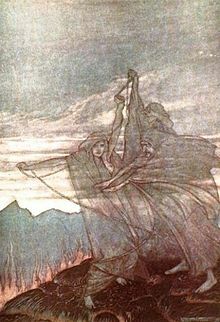 In younger legendary sagas, such as Norna-Gests þáttr and Hrólfs saga kraka, the norns appear to have been synonymous with völvas (witches, female shamans). In Norna-Gests þáttr, where they arrive at the birth of the hero to shape his destiny, the norns are not described as weaving the web of fate, instead Norna appears to be interchangeable and possibly a synonym of vala (völva). 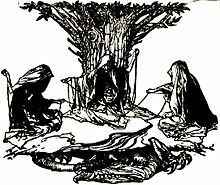 One of the last legendary sagas to be written down, the Hrólfs saga kraka talks of the norns simply as evil witches. When the evil half-elven princess Skuld assembles her army to attack Hrólfr Kraki, it contains in addition to undead warriors, elves and norns. This romantic representation of the norns depicts one of them (Verdandi according to the runes below) with wings, contrary to folklore. Three women carved on the right panel of Franks Casket, an Anglo-Saxon whalebone chest from the eighth century, have been identified by some scholars as being three norns. A number of theories have been proposed regarding the norns. The Germanic Matres and Matrones, female deities venerated in North-West Europe from the 1st to the 5th century AD depicted on votive objects and altars almost entirely in groups of three from the first to the fifth century AD have been proposed as connected with the later Germanic dísir, valkyries, and norns, potentially stemming from them. 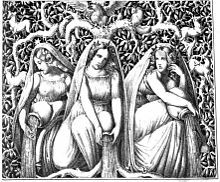 Theories have been proposed that there is no foundation in Norse mythology for the notion that the three main norns should each be associated exclusively with the past, the present, and the future; rather, all three represent destiny as it is twined with the flow of time. Moreoever, theories have been proposed that the idea that there are three main norns may be due to a late influence from Greek and Roman mythology, where there are also spinning fate goddesses (Moirai and Parcae). Viking death metal band Amon Amarth has an album titled Fate of Norns. The band itself has many songs involving Norse mythology. "Nornir" (ノルニル), written and composed by Tika･α, arranged by Naoko Etō and sang by Etsuko Yakushimaru Metro Orchestra, is the opening theme of the 2011 anime Mawaru Penguindrum (episodes 1–14), which has themes of constantly changing fate as its main plot. 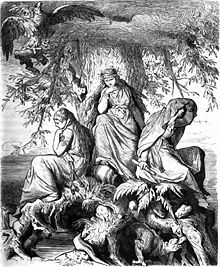 Norns feature in the prologue of Richard Wagner's opera Götterdämmerung. The 1990s Disney TV series Gargoyles features three sisters, referred to by the cast as the "Weird Sisters", that are implied to be Norns. A norn was featured in the fourth season of Hercules: The Legendary Journeys. After his arrival in the Norselands, the norn tasks Hercules with averting Ragnarok. Since the Fates had already been featured in the series, only a single norn appears, who paints history in a book. In the 2010 series Lost Girl, there was a Norn who could be petitioned to change fate, for a price. Her price was always the one thing her petitioner values most, whether they realize it or not. The Norns appear in Marvel Comics, usually in stories featuring the Norse inspired superhero Thor. The Norns also appear in The Wicked + The Divine, published by Image Comics, written by Kieron Gillen with art by Jamie McKelvie and Matt Wilson. They are incarnated from a trio of journalists, led by Urðr, alongside Verðani and Skuld. The main love interest of Oh My Goddess! is the Norn Verðandi, rendered as Belldandy. Her elder sister Urðr (rendered as Urd) and younger sister Skuld also show up, living with the protagonist Keiichi Morisato and their sister Belldandy. Aside from sticking loosely to the theme of Belldandy representing the present, Urd the past and Skuld the future, they are only loosely related to their mythic namesakes in this media. The terminals that Yggdrasil from Digimon created for the New Digital World experiments consisting 3 layers are named Ulud, Versandi, and Skuld which are representing for past, present, and future. Ulud Urðr is a past plain which is a volcanic wasteland, inhabited by Dinosaur type and draconic Digimon. Versandi Verðandi is the "present" region which is a world of lush greenery and is home to beast, bird, plant and other nature Digimon. Skuld is the "future" region, a high-tech city where machine and insect Digimon inhabit. In the Calibur arc of Sword Art Online, Urðr appears to Kirito's party and gives them a quest to retrieve the sword Excalibur from Thrymheim before the last beast-type Evil God is killed, restoring Jötunheimr to its former glory. Upon successful completion of this quest, Urðr reappears to Kirito's party, along with her sisters Verdandi and Skuld. They thank them for completing the quest, and allow them to keep Excalibur. Other figures and elements from Norse mythology also appear in this arc, including Thrym, Freyja, Thor, and Mjölnir. In the anime Norn9, the ship that the main characters live in is named Norn9, after the three Goddesses of Fate. Final Fantasy XI - as Voidwalker Notorious Monsters (VNM) in the Wings of the Goddess expansion. The Witcher 3: Wild Hunt - As the Crones of the forest. ^ a b c d e f g h i j k l The article Nornor in Nordisk familjebok (1913). ^ Sturluson, Snorri (1995). "Gylfaginning". Edda. London, England: J.M. Dent. p. 18. ISBN 978-0-4608-7616-2. ^ Bek-Pedersen, Karen (2011). Norns in Old Norse Mythology. Edinburgh, Scotland: Dunedin Academic Press. p. 191. ISBN 978-1-906716-18-9. ^ Bek-Pedersen, Karen (2011). Norns in Old Norse Mythology. Edinburgh, Scotland: Dunedin Academic Press. p. 169. ISBN 978-1-906716-18-9. ^ a b "Swedish Etymological dictionary". Runeberg.org. Retrieved 2012-12-30. ^ "Etymonline.com". Etymonline.com. Retrieved 2012-12-30. ^ Bek-Pedersen, Karen. 2011. The Norns: Representatives of Fate in Old Norse Tradition. In: Monaghan, Patricia. Goddesses in World Culture. V.2 P.271. ^ Skáldskaparmál in translation by Arthur Gilchrist Brodeur (1916), at Google Books. ^ a b Bek-Pedersen, Karen (2011). The Norns in Old Norse Mythology. Edinburgh, Scotland: Dunedin Academic Press. pp. 18–19. ISBN 978-1-906716-18-9. ^ Bek-Pedersen, Karen (2011). The Norns in Old Norse Mythology. Edinburgh, Scotland: Dunedin Academic Press. pp. 22–23. ISBN 978-1-906716-18-9. ^ Bek-Pedersen, Karen (2011). The Norns in Old Norse Mythology. Edinburgh, Scotland: Dunedin Academic Press. p. 18. ISBN 978-1-906716-18-9. ^ "See commentary by Bellows". Sacred-texts.com. Retrieved 2012-12-30. ^ Fáfnismál Guðni Jónsson's edition of the text with normalized spelling. ^ Fafnismol in translation by Henry Adams Bellows (1936), at Sacred Texts. ^ a b Völuspá Guðni Jónsson's edition of the text with normalized spelling. ^ Völuspá in translation by Henry Adams Bellows (1936), at Sacred Texts. ^ "See also Bellows' commentary". Sacred-texts.com. Retrieved 2012-12-30. ^ Vafþrúðnismál Guðni Jónsson's edition of the text with normalized spelling. ^ The lay of Vafthrúdnir in translation by Benjamin Thorpe (1866), at Google Books. ^ Lays of the gods in translation by Henry Adams Bellows (1936), at Sacred Texts. ^ Helgakviða Hundingsbana I Guðni Jónsson's edition of the text with normalized spelling. ^ The First Lay of Helgi Hundingsbane in translation by Henry Adams Bellows (1936), at Sacred Texts. ^ Völsungakviða in forna Archived 2007-05-08 at the National and University Library of Iceland Guðni Jónsson's edition of the text with normalized spelling. ^ a b Typographical error for Norns, cf. the text in Old Norse. ^ The Second Lay of Helgi Hundingsbane in translation by Henry Adams Bellows (1936), at Sacred Texts. ^ Reginsmál Guðni Jónsson's edition of the text with normalized spelling. ^ The Ballad of Regin in translation by Henry Adams Bellows (1936), at Sacred Texts. ^ Sigurðarkviða in skamma Guðni Jónsson's edition of the text with normalized spelling. ^ The Short Lay of Sigurth in translation by Henry Adams Bellows (1936), at Sacred Texts. ^ Guðrúnarkviða in forna at «Norrøne Tekster og Kvad», Norway. ^ "Bellows' translation". Sacred-texts.com. Retrieved 2012-12-30. ^ Guðrúnarhvöt Guðni Jónsson's edition of the text with normalized spelling. ^ Guthrun's Inciting in translation by Henry Adams Bellows (1936), at Sacred Texts. ^ Hamðismál Guðni Jónsson's edition of the text with normalized spelling. ^ The Ballad of Hamther in translation by Henry Adams Bellows (1936), at Sacred Texts. ^ Sigrdrífumál Guðni Jónsson's edition of the text with normalized spelling. ^ The Ballad of The Victory-Bringer in translation by Henry Adams Bellows (1936), at Sacred Texts. ^ a b c Gylfaginning in translation by Arthur Gilchrist Brodeur (1916), at Sacred Texts. ^ Hlöðskviða Archived 2007-05-08 at the National and University Library of Iceland Guðni Jónsson's edition of the text with normalized spelling. ^ The Saga of King Heidrek the Wise in translation by Christopher Tolkien (1960) verse 104, p. 58, pdf p. 153. ^ Translation of rune inscription N 351 M provided by Rundata. ^ a b Lindow (2001:224). Chisholm, Hugh, ed. (1911). "Norns" . Encyclopædia Britannica (11th ed.). Cambridge University Press.